Join Us!!! We are looking for someone to help us cover Barbados basketball. Please send us an e-mail. The Regular Season in BABA just ended. Host teams show no mercy winning all games. The game between sixth ranked Bulls (8-8) and 8th ranked Hawks (2-14) in on Saturday ended with biggest points difference. Bulls outscored guests from 66-36. Bulls maintains sixth position with 8-8 record. Hawks lost sixth consecutive game. They keep the eighth place with 14 games lost. In the last game of round 28 bottom-ranked Tridents were beaten by Warriors on the road 81-73. No shocking result in a game when fifth ranked Warriors (9-7) beat at home bottom-ranked Tridents (1-15) 81-73 on Saturday. Warriors maintains fifth position with 9-7 record. Tridents at the other side stay at the bottom place with 15 games lost. Power forward Granville Gittens (198-F/C) had a great game in the last round for second-ranked Cavaliers and receives a Interperformances Player of the Week award for round 9. He had the game-high 16 points adding eight rebounds and six assists for Cavaliers in his team's victory, helping them to crush Lakers (#3, 4-2) with 21-point margin 84-63. The game was between two of the league's top four teams. Cavaliers maintains the 2nd position in Barbados league. They are still close to the very top. Cavaliers would have been even better if they kept winning the games like in the last round. They have a solid 5-1 record. In the team's last game Gittens had a remarkable 57.1% from 2-point range. He turned to be Cavaliers' top player in his first season with the team. Baruch College graduate has very impressive stats this year. Gittens is in league's top in points (7th best: 15.8ppg) and averages solid 1.5bpg. Second best performed player last round was Joel Hunte (C). He is a center in his 4th season at Cavaliers. In the last game Hunte recorded impressive 21 points, 9 rebounds and 4 assists. Of course together with Gittens he helped Cavaliers with another comfortable win outscoring slightly lower-ranked Lakers (#3, 4-2) 84-63. It was definitely game of the week between two contenders to the title. Cavaliers consolidated its place in top 2 of the standings. His team lost just one game this season, while they won 5 matches. Hunte is one of the most experienced players at Cavaliers and similarly like Granville Gittens has a reputation of one of team's most reliable players. Third place about best performers goes to forward Justin Pile (F) of Warriors (#6). Pile scored 27 points. He was a key player of Warriors, leading his team to a 89-53 easy win against Celtics (#7, 0-6). Warriors can only dream about fighting for top spots in the league. They have rather bad season and 1-5 record places them close to the bottom of the standings. Too bad for Pile he does not play for a better team. But maybe if he did, his season stats would not be that high. Pile has individually a great season in Barbados. After only 6 games, he made it on the list of the league's leaders in points with 22.0ppg (best scorer). He also has 2.5spg and 1.7bpg. Round 9 most important game was a victory of Warriors over bottom-ranked Celtics 89-53 on Sunday night. Warriors forced 29 Celtics turnovers. They looked well-organized offensively handing out 24 assists. It was a good game for international forward Justin Pile who led his team to a victory with 27 points and 4 steals. 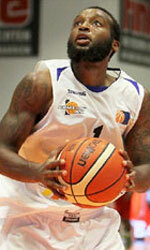 Center Ricardo Toussaint contributed with 12 points, 13 rebounds and 6 assists for the winners. Center Jonathan Fitt answered with a double-double by scoring 13 points and 12 rebounds for Celtics. Warriors (1-5) left bottom position moving up to sixth place. It was Celtics' sixth loss in a row. Newly promoted team still closes the standings with six games lost. Another interesting game for Bridgetown (5-1) which played on the court of Lakers (4-2). Second ranked Bridgetown crushed hosts 84-63. Center Joel Hunte stepped up and scored 21 points, 9 rebounds and 4 assists for the winners and Granville Gittens chipped in 16 points, 8 rebounds and 6 assists. Bridgetown's coach felt very confident that he used entire bench which allowed the starters a little rest for the next games. The best for the losing side was the former international forward Mark Bridgeman (198-89) with a double-double by scoring 16 points, 11 rebounds and 4 assists. Defending champion maintains second place with 5-1 record behind leader Bulls. Lakers at the other side keep the third position with two games lost. An interesting game for Bulls (6-0) which hosted in 4th placed Pinelands (3-3). Leader Bulls had an easy win 101-86. Andrew Ifill nailed 17 points, 5 rebounds, 9 assists and 4 steals for the winning side. Ian Alexander came up with 24 points for Pinelands in the defeat. Both coaches used bench players and allowed the starting five to rest. Undefeated Bulls have an impressive series of six victories in a row. They maintain first place with 6-0 record. Loser Pinelands keep the fourth position with three games lost. An interesting game for Bulls (6-0) which hosted in 4th placed Pinelands (3-3). Leader Bulls had an easy win 101-86. Bulls forced 27 Pinelands turnovers. They looked well-organized offensively handing out 24 assists. Forward Andrew Ifill (180) nailed 17 points, 5 rebounds, 9 assists and 4 steals for the winning side and the former international power forward Akeem Marsh (206-87) accounted for 19 points and 9 rebounds. Five Bulls players scored in double figures. Forward Ian Alexander (198, college: John Brown) came up with 24 points and the former international forward Ramon Simmons (193-86, college: Bridgeport) added 19 points and 5 rebounds respectively for Pinelands in the defeat. Both coaches used bench players and allowed the starting five to rest. Bulls have an impressive series of six victories in a row. They maintain first place with 6-0 record. Loser Pinelands keep the fourth position with three games lost. Round 9 most important game was a victory of Warriors over bottom-ranked Celtics 89-53 on Sunday night. Warriors forced 29 Celtics turnovers. They looked well-organized offensively handing out 24 assists. It was a good game for international forward Justin Pile who led his team to a victory with 27 points and 4 steals. 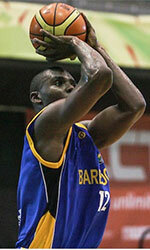 Center Ricardo Toussaint contributed with a double-double by scoring 12 points, 13 rebounds and 6 assists for the winners. Four Warriors players scored in double figures. Center Jonathan Fitt answered with a double-double by scoring 13 points and 12 rebounds and guard Stevenson Callender added 16 points in the effort for Celtics. Warriors (1-5) left bottom position moving up to sixth place. It was Celtics' sixth loss in a row. Newly promoted team still closes the standings with six games lost. Another interesting game for Bridgetown (5-1) which played on the court of Lakers (4-2). Second ranked Bridgetown crushed hosts 84-63. Bridgetown forced 22 Lakers turnovers. Their players were unselfish on offense dishing 23 assists. Center Joel Hunte stepped up and scored 21 points, 9 rebounds and 4 assists for the winners and American power forward Granville Gittens (198, college: Baruch) chipped in 16 points, 8 rebounds and 6 assists. Bridgetown's coach felt very confident that he used entire bench which allowed the starters a little rest for the next games. The best for the losing side was the former international forward Mark Bridgeman (198-89) with a double-double by scoring 16 points, 11 rebounds and 4 assists and guard John Jones produced a double-double by scoring 15 points and 11 rebounds. Both teams had four players each who scored in double figures. Defending champion maintains second place with 5-1 record behind leader Bulls. Lakers at the other side keep the third position with two games lost. American Granville Gittens (198-F/C) put on an extraordinary performance in the last round for league's second-best Cavaliers and that's him to receive a Interperformances Player of the Week award for round 8. The power forward had the game-high 19 points adding eight rebounds and seven assists for Cavaliers in his team's victory, helping them to outclass, the league's bottom-ranked team Celtics (#6, 0-5) with 48-point margin 101-53. Cavaliers maintains the 2nd position in Barbados BABA. They are still close to the very top. Cavaliers would have been even better if they kept winning the games like in the last round. They have a solid 4-1 record. In the team's last game Gittens had a remarkable 58.3% from 2-point range. He turned to be Cavaliers' top player in his first season with the team. Baruch College graduate has very impressive stats this year. Gittens is in league's top in points (7th best: 15.8ppg) and averages solid 1.6bpg. The second most remarkable performance in last round's games was another Cavaliers' star - center Joel Hunte (C). Hunte impressed basketball fans with a double-double of 16 points and 10 rebounds. Of course together with Gittens he helped Cavaliers with another comfortable win outscoring Celtics (#6, 0-5) 101-53. Cavaliers' second position in the standings has not changed. His team lost just one game this season, while they won 4 matches. Hunte is one of the most experienced players at Cavaliers and similarly like Granville Gittens has a reputation of one of team's most reliable players. The third best performed player last round was another Cavaliers' star - Jamai Puckerin (F). Puckerin scored 20 points and grabbed seven rebounds. He was another key player of Cavaliers, helping his team with a 101-53 easy win against Celtics (#6, 0-5). Cavaliers is closer and closer to top of the standings. They will still need more victories. But 4-1 record is not that bad... Puckerin has a very solid season. In 5 games in Barbados he scored 10.0ppg.